Sandvine, a company selling deep-packet inspection gear to ISPs, shared a blog post noting that in one East Coast city on the Monday ahead of Sandy’s landfall in New Jersey, Internet traffic was up 114 percent. Sandvine also tracked a more than 150 percent rise in Netflix (s nflx) traffic, which was later confirmed by Netflix. 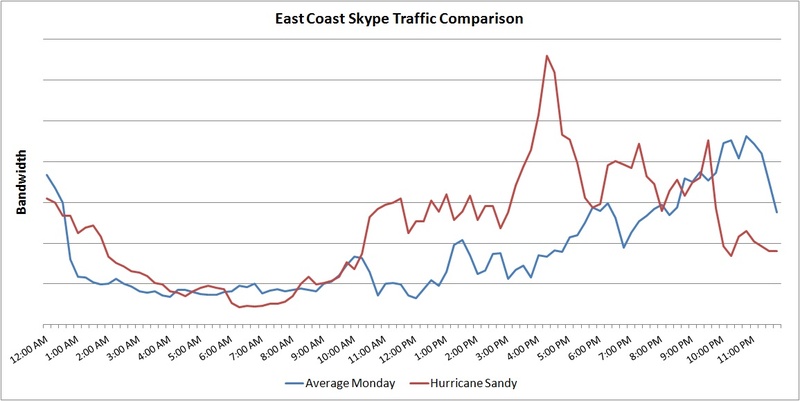 Skype usage in the afternoon was up as well. The Sandvine post noted that, “No single application was responsible for the surge; usage patterns were, for the most part, similar to what is observed on weekday evenings.” While the uptick in entertainment seems obvious, the results should encourage those worried about whether our networks can handle some problem that forces workers to stay home and attempt to telecommute. Apparently they can, or they can until the power goes out and the floodwaters swamp the telecommunications infrastructure. Hurricane Sandy photo courtesy of Flickr user NASA Goddard Photo and Video. 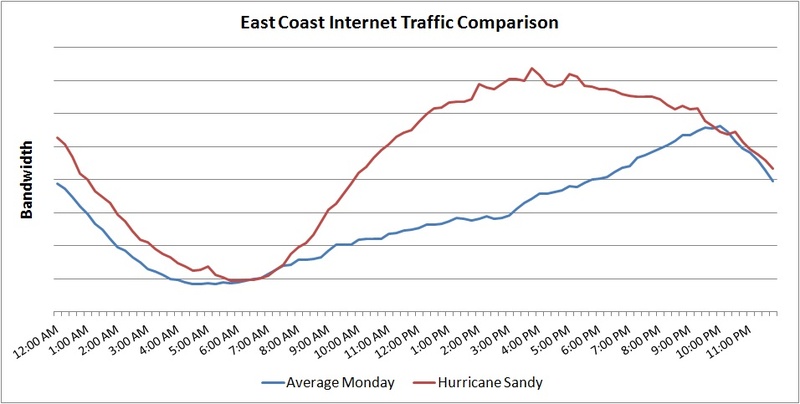 Fascinating to see the traffic peak after 3pm, when the hurricane effects were supposed to be first hitting. I suspect the peaks and valleys are based on intensity of the storm? Can anyone shed light on why there was a peak at 7pm and another at 10pm? And can we assume the sudden uncharacteristic drop after 10pm is when power starting going out? Good stuff. Is there a breakdown of the Mobile usage during the same time? I don’t have those numbers, but they would be interesting. The spike in Communications apps might also be tied to cell tower failure, and people turning to services like Skype on home wi-fi to call people. This is something that was observed by Japanese fixed networks during the 2011 earthquake/tsunami. Thanks Dan for sharing your insights both on the Sandvine blog and here! I am the author of the blog post used by Stacey. The y-axis is in bits/sec, but in public releases like this we don’t actually show numbers as our data sources can vary both in number of participants and access technology type with each study. For that reason, whenever we publish data we do so in a manner which typically talks in traffic share as opposed to raw bits. Sorry I couldn’t be more help, but if this type of information is of interest to you, we are planning on publishing our 2H 2012 Global Internet Phenomena Report next week. Could you please add numbers on the Y axis?